On Saturday, February 24, working people across the country gathered together for the "Working People's Day of Action" and to stand up for our right for a better quality of life not only for ourselves but for all our families, friends and co-workers as well. This date was selected around the narrative of Dr. Martin Luther King's I AM A MAN and to mark the 50th Anniversary of the first march conducted by striking sanitation workers in Memphis, TN. This event also honors the long history of labor rights activists and civil rights activists. This Working People's Day of Action event was held at the San Diego Convention Center, the site of this year’s California Democratic Convention. 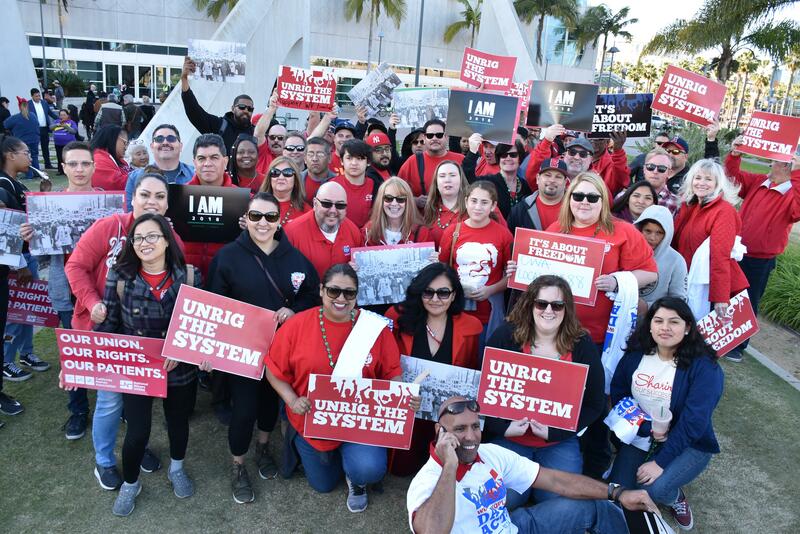 Union Members and their families, plus Delegates from the convention flooded the adjacent San Diego Convention Center Park so that their voices could be heard. CWA members from all over California participated in a CWA STRONG show of unity. This event was planned just ahead of the Supreme Court consideration of JANUS vs. AFSCME-a controversial legal challenge to a longstanding precedent that protects the ability of public employee unions to represent their members, and even nonmembers, and to speak out on matters of public interest. The Working People's Day of Action event, in San Diego, was part of a larger Nationally organized strategy which included similar displays of unity in Washington, D.C., Miami, Florida, Chicago, IL, Indianapolis, IN, Detroit, MI, St. Paul, MN, New York City, NY, Columbus, OH, Philadelphia, PA, Sioux Falls, SD, Memphis, TN and Louisville, KY.